Finding success in the NASCAR Camping World Truck Series event on Wednesday night and the Nationwide Series Food City 250, Kyle Busch had turned the victory lane of Bristol Motor Speedway into his own personal parking spot. 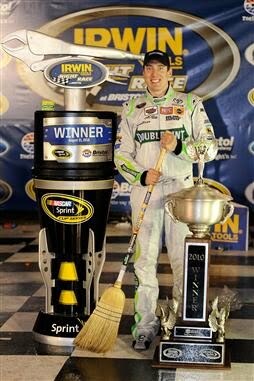 Starting the NASCAR Sprint Cup Irwin Tools Race Night event, Kyle Busch and the #18 Joe Gibbs Racing team needed to overcome a sub-par qualifying run resulting with only 19th place position to complete a monumental triple-sweep. Though the slight chance of rain sprinkled the 0.533 mile short oval with a light shower during pre-race, the 500-lap Irwin Tools Night Race started on schedule with Hendrick Motorsports’ #48 Lowes Chevrolet leading the way. Jimmie Johnson has only 1 top-10 finish in the past 6 Sprint Cup races since his last win in June’s New Hampshire. Starting on the pole position, Johnson led 175 of the race’s first 200 laps. This early run in the Irwin Tools Night Race began with a 57-lap green flag run before the first caution for the #38 Ford of Tony Raines. As the green flag flew again, another 66 lap sprint saw Jimmie Johnson leading over #14 Chevy of Tony Stewart and the #99 Ford piloted by Carl Edwards at the first quarter distance. Unfortunately, two of the top three cars would have their early success scuttled when they the #14 and the #99 were involved the second caution. Entering pit road, the #6 UPS Ford of David Ragan slowed causing a chain reaction bumper-bashing incident between Carl Edwards’ front and Tony Stewart’s rear. Edwards and Stewart endured the race with minor damage but were never a factor for victory through the future laps. Leaders flowed into pit lane under the caution led by Jimmie Johnson who also led the field out of the tight Bristol road. With the race important to determining to 12 drivers who will race for the 2010 NASCAR Chase for the Sprint Cup, two competitors hovering around the bottom side of the final transfer spot would be penalized for pit errors. With many typical players such as Kyle Busch requiring an early rally from weak qualifying runs, several rose to the occasion. On lap 172, the #18 Toyota of Busch moved from 19th on the start to take the lead becoming the first driver to authentically challenge Johnson’s than-dominant #48 Chevy. Other Hendrick Motorsports drivers Jeff Gordon and Dale Earnhardt Jr also mounted some wonderful recoveries by the mid-point of the Bristol race. Performing a 16 spot gravitation to the front, Gordon’s #24 Chevy broke into 10th place while Earnhardt Jr’s #88 Chevy was up to 14th evidently learning something after an exciting 4th place run ending the previous night’s Nationwide Series event. Dropped from the lead but still firmly matched against the #18 Toyota, the #48 of Johnson was running 3rd past lap 200 having also been passed by the #00 Toyota of David Reutimann. Reutimann had been fighting a illness before the race but stuck it out for the entire Bristol race incident. Johnson retook the second place spot prior to the midway point but would come under the charge of Earnhardt Ganassi Racing’s #42 Chevy of Juan-Pablo Montoya. With the field set up in a double-file restart following a one-car accident with Bobby Labonte, Montoya was allover Johnson’s rear attempting to pass the #48 Chevy on the outside. Exiting turn 2, Montoya turned into the #48 Chevrolet on lap 262 directing Jimmie Johnson’s car into the outer wall. Also in this accident, the #11 Toyota of Denny Hamlin slid sideway though was not involved in direct contact with Johnson or Montoya. 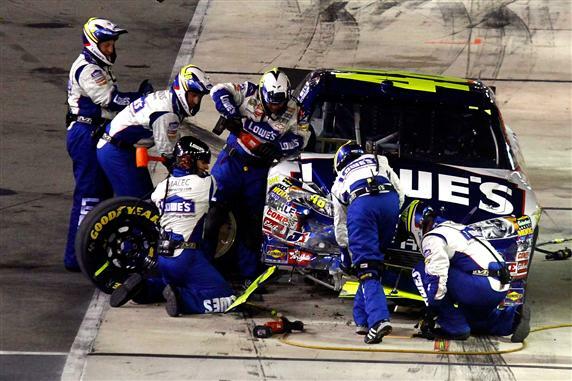 Requiring extended repairs by the Hendrick Motorsports pit crew behind the wall, the #48 Lowes Chevrolet’s oil cooler and suspension damage eventually cost the team 85 laps resulting in a 35th place finishing position. Denny Hamlin finished just one spot better through only 27 laps behind as the Joe Gibbs Racing car needed less time to restore to running condition. As a primary contender of the Irwin Tools Night Race effectively eliminated from race, the #18 car of Kyle Busch appeared to be sparred with a much improved chance of victory. Leading consecutively for 133 laps, Busch would in fact be challenged through two points of the latter stages of the night race. Jamie McMurray led for 11 laps with his #1 Chevrolet while David Reutimann led 25 circuits during the final 100 lap distance. However, at the end, it was going to be Kyle Busch’s night at Bristol Motor Speedway. Sweeping the weekend, Busch became the first driver to do so in the sporadic period which the three major NASCAR touring series have raced at Bristol. Just one position short, David Reutimann nonetheless accomplished a fantastic feat to finish in the runner-up spot. As an important ramification for the 2010 Chase for the Sprint Cup, 13th place in points Jamie McMurray finished 3rd but was unable to make a major move on the coveted 12th place spot held by Clint Bowyer. Despite some early promise for McMurray when Bowyer’s #33 Chevy was penalized, the Richard Childress Racing car recovered to 4th. Driving the #9 Ford that was also nailed by pit road issues, Kasey Kahne also performed a massive pick up to round out the top 5 for the Irwin Tools Night Race at Bristol Motor Speedway. Finishing 14th, Kevin Harvick lost a few points in the NASCAR Sprint Cup championship but it was insignificant for denying the #29 team a 2010 berth. 2nd place in points Jeff Gordon also secured his position in the Chase with an 11th place at Bristol. With only 2 races left before the 10-race, 2010 Chase for the Sprint Cup, positions 3 through 12 are still in play. Drivers like Jimmie Johnson, Tony Stewart and Denny Hamlin suffered big losses in short track round at Bristol but are still fairly located in locking up Chase spots. Outside looking in, drivers Jamie McMurray, Mark Martin and Ryan Newman are within a mathematically-accessible reach to 12th place Clint Bowyer. With a week off for the NASCAR Sprint Cup series, the labour day weekend race at Atlanta Motor Speedway is next up on September 5th.